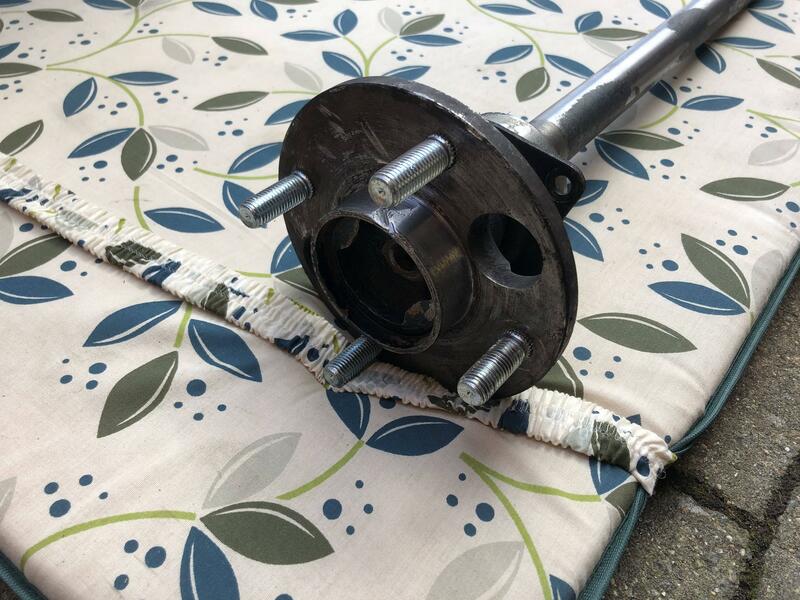 I've bought a nice set of 13" wheels and have now discovered that my (live axle) rear hub has got a slight wider diameter (69mm) at the back, than at the front (67.1mm). The wheels I bought have a centre bore of 67.1mm but I can only run them with a spacer at the moment to get round the wider diameter at the back. Unfortunately it also means that due to my lardy weight the tyre on the driver side rubs on the wheel arch when I hit any sort of bump in the road. So either get the hub turned down to 67.1mm or increasing the centre bore on two wheels to 69mm... Anyone in Northants able to help? I'd have thought cheaper and easier to pop the half shafts out and have the hubs turned down. Anyone with a big lathe can then do it, bung some guy at a machine shop £10 to do it on his lunch break? I'd favour having the centre bore of the wheels enlarged to Ø69 to fit the hubs. Then you (or subsquent owner(s)) can fit the right centre bore wheels in the future. To me "popping out the halfshafts" doesn't sound so easy... But that would be my ideal way of resolving the issue. I've had the same issue in the past, I had a set of Mini wheels and wanted to use them on a mk2 golf..
Take the wheels to any eng workshop. Milling machine with a 360 degree rotating bed should do the trick. I can do either for you but preferably the halfshafts. I've looked at a few videos and removing the half shafts looks to be as simple as AdamR20 suggested. But putting them back in, does anything need replacing? Or any special tools needed? I would find out which center bore has more options available for your application and machine to suit. There are a few Internet sites that list them. Nothing special to replace, just some sealant for the bearing where it goes into the axle casing. 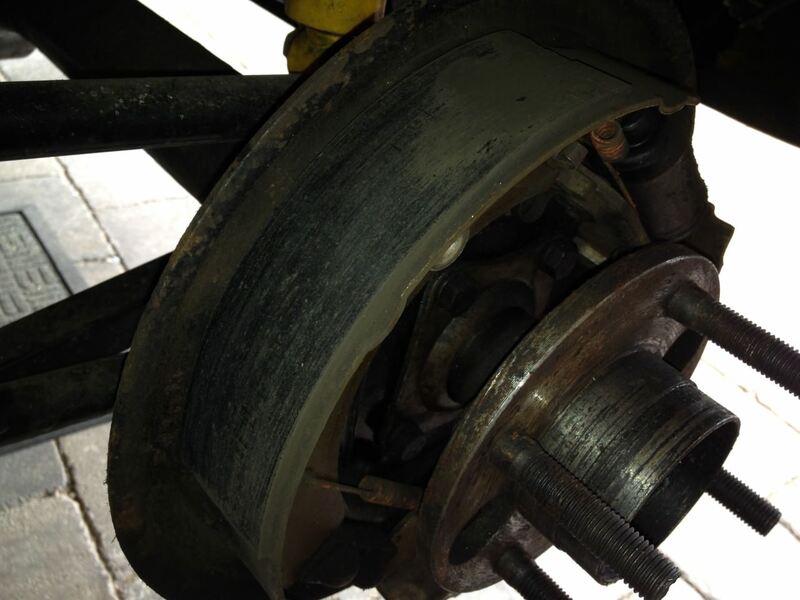 Have run the 'wrong' wheels (centre bore too big) on a 1 ton track car before, no issues. The wheel bolts / nuts give about 8 tons clamping force each at correct torque, no need for the lip on the hub really. Does help to centre the wheel when fitting though. The slightly raised lip on the hub is only there for the last 14mm. I'm assuming I would need to remove the studs too before it can be put on a machine? There is a device called a Mag Drill Cutter (Rotabroach) a type of Annular Cutter but very precise. It would be relatively easy to increase the size of spigot hole with relative precision. If you made a jig on a lathe, the jig would be a round bar with a 6.5mm hole to take the centre pin guide and the outside turned to the size of the existing spigot hole. . You would need a Mag Drill machine but these can be hired. You would also need a steel plate and attach it firmly to the alloy wheel in some way. The Mag drill cutter see eBay item number: 132487844795 A high risk approach because if you get it wrong you would have an unbalanced wheel, not nice to drive. You could leave the studs in. Happy to do the machining for you, but I am near Preston. Edit: the 'stubs', where the wheels fit over, on your half shafts look unusually big / tall. I also have the same axle in my car and have it all apart at the moment, going to do some machining work on them today in fact! It all sounds in the realm of do-it-yourself though, so I'm going to stop thinking about it, and just get on with it. Good man, I'm sure you'll sort it. Could even knock the studs out and grind the lip back. Studs will go back in with a wheel nut and a load of washers. Apologies for taking this in a slightly odd direction, but there is something I'd like to ask on this subject. 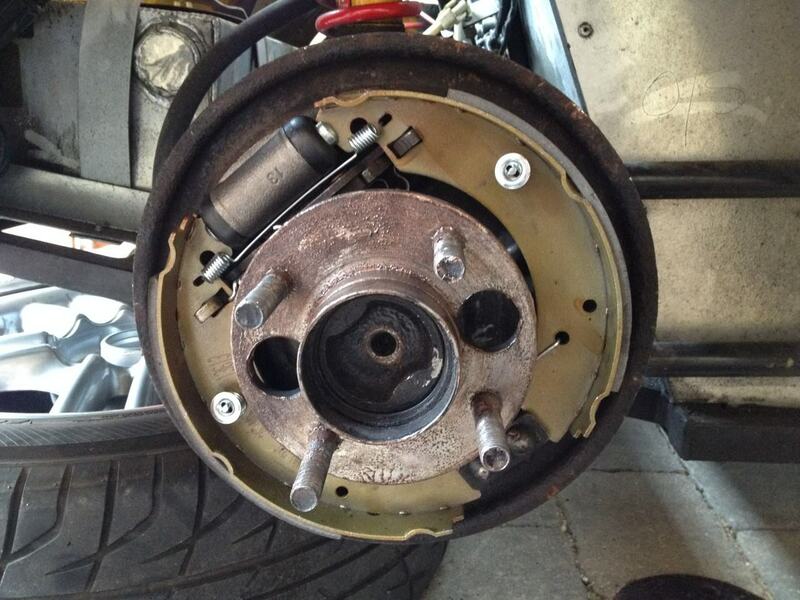 Several people (and many websites) have suggested the centre bore isn't a critical part of keeping a wheel on a car. There is a view that once the wheel is attached to the car with the bolts/nuts, that the wheel is centralised and not going anywhere. Obviously it helps with getting the wheel on in the first place, but after that not so much. As people on here are a little more knowledgeable than the average internet keyboard warrior, what is the right answer? Does it actually contribute to the wheel staying attached? or is the 100lbft of wheel nut torque and the surface area of the hub sufficient to keep the wheel solid under braking and cornering? Just looking at the answers here it looks like AdamR20 has been in this situation with no ill effects, any others? Got an old drum? Bolt it on 'backwards' then you can give it some welly from the back. Yeah, that's how I tried. Unfortunately, my garage is limited in space and I had put the car up on axle stand in the middle (so I could do both sides if I got that far), but that meant I had a very limited space at the side so I could not put my full weight/strength into it. 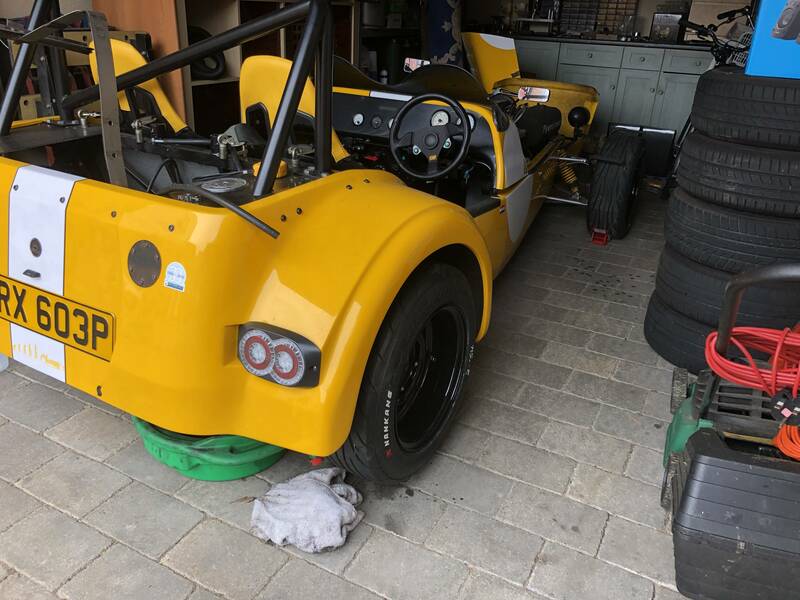 I didn't want to do it outside where I've got plenty of space, in case it went pear shaped as I would then be left with a car on axle stands, unable to be moved inside overnight. With a chunky hammer it should come free, the ones I just did wouldn't budge with all the usual tricks, but the backwards drum worked. They had been in there at least 25 years! the halfshafts or the wheels? which is the part that does not match? the wheels or the halfshafts? the halfsafts where first and the wheels do not match. so i would never ever modify the halfshafts. you can also put the wheels on a lathe and enlarge the innner bore. much easier as you need to remove the wheels anyway...before you get access to the half-shafts. I agree, but we are DIYers and have to be realistic I think! Who has a lathe capable of taking a 600mm diameter item in their garage? Or one that'll take 400mm and a tyre machine? After borrowing a sliding hammer the halfshafts came out straight away. Took them to a friend who had offered to machine them down but when he looked at them more closely, he spotted that it looked like there was a collar fitted that contained the raised lip. So took them home again and after 5 minutes with the angle grinder got the collars off. Halfshafts back in and car back on the road on its new wheels!